“Even atheists?!? I am a Catholic and I am a Catholic so that I can have the fast-track paradise easy pass because I am in communion with the one true church… I just think that maybe someone should have mentioned that believing in God was optional.” He then proceeds to pray to a stapler. [This] is not universalism. It might appear to be so if you don’t know that there is a difference in traditional Christian theology between being saved and being redeemed. The redemption that Christ accomplished through the incarnation, cross and resurrection was for all of human nature, and so it is quite correct to say “The Lord has redeemed all of us, all of us, with the Blood of Christ.” Redemption is something that happens for human nature, which is why all will be resurrected in the end and why all are capable of doing good. But that is not the same thing as saying that all will be saved, and it certainly isn’t saying that everyone will be saved by doing good. 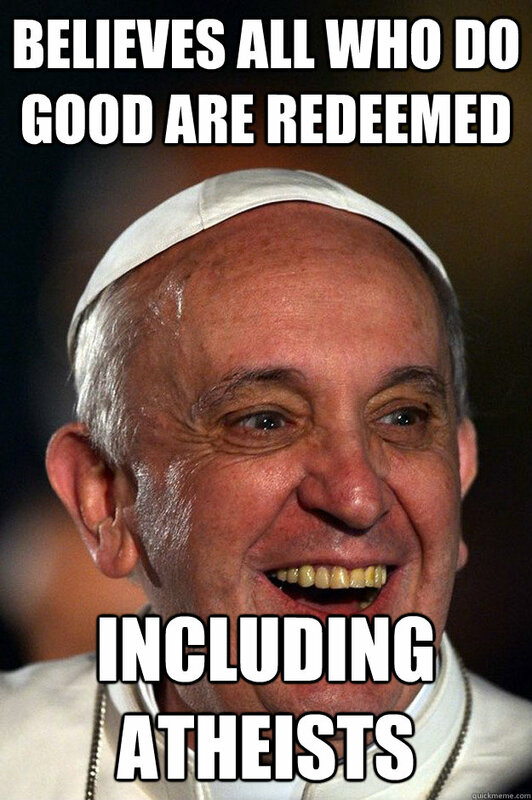 It’s not even saying that everyone will be redeemed by doing good. Salvation, in distinction from redemption, is centered on the individual person, not on the whole of human nature. Salvation is what the individual person does with the redemption that Christ has given to all, and it involves much more than simply doing good. But Francis holds out the possibility here for an encounter, that we may “meet one another” when good is done, by whoever it may be done. And he is absolutely correct. All good is from God, so even an atheist—even an anti-theist—who does good is in some sense participating in God’s goodness by virtue of his redemption by Christ and remaining created according to the image of God. But that doesn’t mean he is saved. The argument that Damick is advancing is that the ability to do good is, like redemption, a quality that is inherent in all humans. Salvation, on the other hand, is enabled through universal redemption, but takes individual acceptance of Christ to be achieved. He also highlights that the point of the initial statement was not redemption, but the possibility of doing good. Many non-Christians agreed with the final statement and focused on the Pope’s statements as affirmation that morality and good works are not solely the property of the religious. Many also saw it as a vindication of their belief and as proof of the normalization of atheism that it was singled out. However, as expressed by several voices on Reddit, the idea that all people could do good is not a new one, nor is the delineation between salvation and redemption. There are of course countless moral issues to talk about, and I truly hope that Pope Francis will continue to reach out to atheists. Maybe we can start to have a meaningful dialog on these and many other moral issues in the future. This highlights the key point in the pontiff’s statement: opening up inter-religious dialogue in a way that it had previously been closed under Benedict and again pushing towards dialogue between religious groups. However, unlike under previous pontiffs, who formerly called for inter-religious dialogue, this is calling for a dialogue between the religious and the non-religious. More than just calling for the dialogue, Francis identifies the space for that dialogue, framing as an encounter over good deeds rather than an opportunity to debate ideas and beliefs. Here the use of space, both in the initial statement and in the mediation of the conversation surrounding it, is the most interesting aspect. As with most discussions occurring online, this conversation was multi-dimensional, occurring on numerous platforms and continuously informed by all of them. (My first exposure to this was a screen shot from Tumblr posted on Facebook via a link to Tickld.) Conversations from one delineated space flow into others with almost no resistance and are propagated through practices of sharing, in turn generating new conversations. Within the original statement, Pope Francis promotes a “culture of encounter” and speaks of it as a “path towards peace.” This Patheos article deals with some of the practical concerns of a “culture of encounters,” but regardless of practical applications, the metaphor presents good deeds as a space for commonality and as a starting point in dialogue. Like the previous quote from the Huffington Post, Francis is putting forward not a space for religious debate or another avenue for conversion, but a space to encounter each other and have a dialogue concerning moral issues.